It's got a bigger screen. Is it a big deal? What's black and white and meh'd all over? That's right: it's the iPhone 5, which appears to be the most technically advanced and most slagged off iPhone ever made. After months of leaks, many of which proved to be correct, Apple finally showed off its latest creation this week - although not before it had leaked its own product with a bit of careless web editing. The iPhone 5 may look like a stretched iPhone 4S, but there's a lot more to it than that - and as you'd expect, we've got all the details for you in one handy place. The highlights? The Retina display is bigger for widescreen video and an extra row of apps, it's faster, the phone supports 4G LTE (but only EE's variant, which is okay for now as that's the only 4G we're getting this year) and there are new headphones, dubbed EarPods, which have got to be better than the crappy ones Apple currently ships. It's thinner and lighter - Apple reckons it's the thinnest smartphone in the world - and the traditional Dock connector has been replaced with a smaller one Apple calls Lightning. That's Apple's idea of a joke, because its latest desktop data connector is called Thunderbolt. Thunderbolt and Lightning! Very very frightening! Oh dear. Phil Schiller explains more here, and thankfully he doesn't try any more jokes. In addition to the hardware, the iPhone 5 will also ship with iOS 6, which makes Siri better, introduces Apple's own mapping service and which also comes to other iOS devices next week. When can you get it? You've probably got three questions about the new iPhone: is it any cop? When can I get it? How much will it cost? We can answer all three. As our hands-on explains in detail, it's a lot of cop: while it's hardly going to "send shockwaves shuddering through the tech world and turn competitors back to their drawing boards" it is "a fine phone that will keep it battling at the top of the charts for another year". Prices start at £529 (unlocked), and pre-orders start today, with units shipping on the 21st. 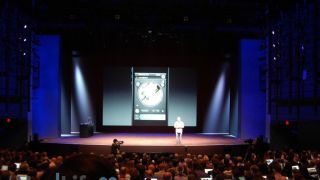 If you want to use the iPhone 5 on EE's 4G LTE network, though, you'll need to wait a bit longer: as they told us "EE will launch an exclusive 4G LTE version of the new iPhone when the EE customer brand launches in the coming weeks." The online reaction was fairly muted, as Gareth Beavis explains: "The immediate response to the iPhone 5 has been one we've seen time and again: is that it?" Beavis doesn't doubt that the iPhone 5 will sell in huge numbers, but he doesn't think the iPhone 5 is Apple at its best. "this is the best iPhone yet without a shadow of a doubt. But what's so special about it beyond a slightly larger screen and a two tone back?" For Beavis, the iPhone 5 is a disappointment. "If Samsung or HTC brought out a phone that was the same shape as the predecessor and then followed it up with the same thing but a bit longer and with new headphones, it would be dismissed as an also-ran before the handset hit the shelves." Gary Marshall feels the magic's missing too, but he isn't pointing the finger at Apple. "I blame the internet," he says, arguing that leaks have sucked the fun out Apple product launches: "When you know every single detail, the effect is rather like sitting through one of those bum-numbing Powerpoint presentations where you've read every bullet point but the presenter's still reading each one out verbatim in a really slow and annoying voice." For Marshall, endless leaks have robbed Apple product launches of their sparkle. "We're better informed but less entertained, more knowledgeable but less excited," he says. "The world's short enough of magic. It's a shame to lose a little bit more."